SINK THE BISMARCK!—-the baddest Nazi battleship of all churns out to sea for gunnery practice on Allied convoys, and it’s up to the Royal Navy to give her a direct course to the bottom. This is the sort of semi-documentary war flick that the British excelled at in days gone by, and it’s a gripping saga, even if the outcome is foregone. 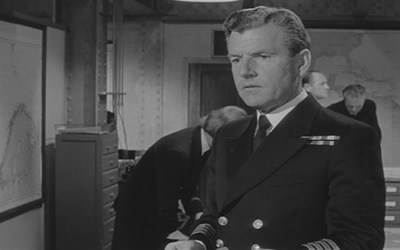 A most capable cast of stiff-upper-lip types are right at home, headed by the sterling Kenneth More. Fans of this oldie will recognize Laurence Naismith, Geoffrey Keen, Michael Hordern and Maurice Denham, while the Germans are ably represented by Carl Mohner and Karel Stepanek. 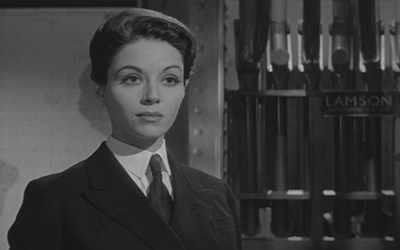 Dana Wynter brings a dash of femininity, but it’s not a superfluous addition, and the scenes between her and More are low-keyed and effective. The crisp b&w camerawork from Christopher Challis is just right, the plotting of naval strategies is clear, the editing sharp, all steered by Lewis Gilbert in the director’s chair. The model work is superior, and the roaring exchanges of pyrotechnics between the Bismarck and the Hood, Prince of Wales, et.al are some of the best ever done prior to the advent of CGI. Great visual effects and sound. A war movie staple and decent history lesson for the average schmo. Released in 1960, it’s a no-nonsense 97 minutes, and there is a bonus introduction from Edward R. Murrow. If you have super-quick eyes, you might spot unbilled appearances from Bernard Lee, David Hemmings and Edward Judd. Shortly before the Stateside release, pop-star Johnny Horton’s hit tune came out as extra publicity (it doesn’t play in the film). The film cost 20th Century Fox around $1,330,000 and returned a strong $8,500,000 over here in America, #36 for the year, as well as doing expected brisk business in England. Good show, chaps. One last item of note: the commander of the Prince of Wales is played by Esmond Knight, who 19 years earlier lost an eye on May 23, 1941—serving as a gunnery officer on the Prince of Wales in her battle with the Bismarck. Though his wounds cost him dearly, the recovery period kept him from likely death in December of ’41, when Japanese torpedoes and bombs finished what the Nazi battleship tried to do, sending HMS Prince of Wales to the bottom, along with the captain later played by Mr. Knight.